LONDON -- Maurizio Sarri has revealed he rarely communicates with Roman Abramovich and denied the Chelsea owner ordered him to give Callum Hudson-Odoi and Ruben Loftus-Cheek more playing time. Abramovich has not visited Stamford Bridge since the UK government denied his request to extend his investor visa last year, despite the fact he is able to enter the country on an Israeli passport after gaining citizenship. His absence -- as well as his decision to halt the proposed £1 billion redevelopment of Stamford Bridge -- has prompted speculation that he is prepared to sell Chelsea, despite the repeated insistence of club officials that he is as invested in the team's success as ever. Asked if he was concerned by a report in the Times this week revealing that Abramovich did not pay for an executive box at Stamford Bridge this year for the first time in a decade, Sarri said: "I don't think so. He has some problems now, but he is involved with the club, with the team." 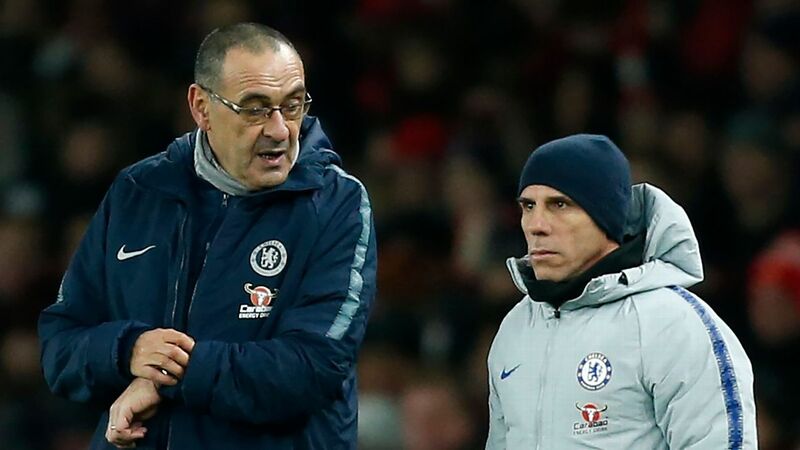 Clarifying that Chelsea assistant Gianfranco Zola communicates with Abramovich more frequently than he does because of his superior command of English, Sarri added: "He is the owner, and so he is able to influence the technical staff, the club, the players, everything I think. "Also in Naples, the president Aurelio [De Laurentiis] wasn't in the training ground every day. He was in the training ground once a month, no more. So it's really very similar." Abramovich's influence does not extend as far as team selection however, according to Sarri. When it was suggested that he had been put under pressure to play the likes of Hudson-Odoi and Loftus-Cheek more often, the Italian replied: "No -- it's up to the players. They are improving. In this moment of the season, they are fresh. So I think that, in this moment, they are really very important for us. "At the beginning of the season, [Hudson-Odoi] had a very great potential but wasn't ready to play in the Premier League. [Loftus-Cheek] the same. He had only to adapt to my football, to improve tactically for my football. Then he had a lot of problems with his back, and so we had to wait for him. But now they are fresh, they are ready." Hudson-Odoi and Loftus-Cheek both impressed in Chelsea's 3-0 victory over Brighton on Wednesday. Sarri made seven changes to his starting XI for the match, also giving Olivier Giroud a chance to impress ahead of the struggling Gonzalo Higuain. Giroud -- who has made no secret of his discontent at not being first-choice striker at Stamford Bridge -- responded by scoring his first Premier League goal since November, and Sarri revealed he would like to keep the Frenchman around next season. "Yes, of course," he said. "I know the club have an option [to extend his contract] for another season, so I think he will remain." Asked if he thinks Giroud wants to stay at Chelsea, Sarri replied: "I think so."